As we continue to recognize inspiring women, creativity, and general badassery in our Studio LB community, Julia Wester immediately comes to mind. 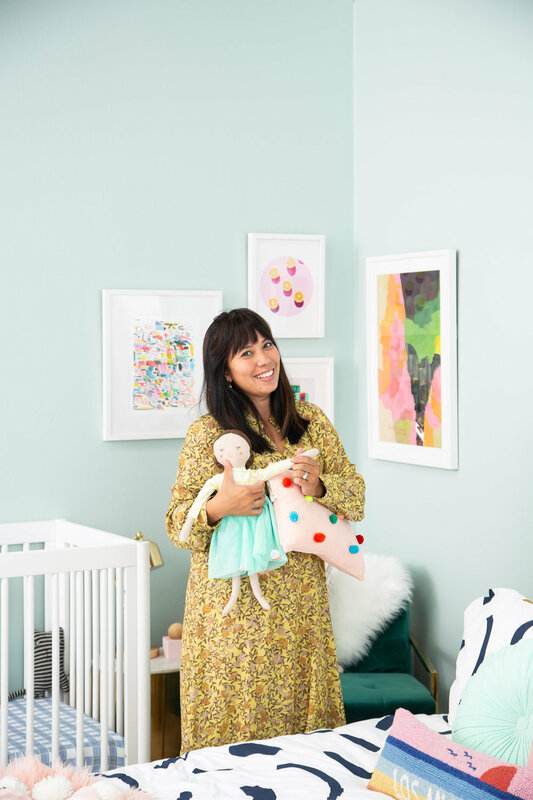 She is the Creative Content Producer and Prop Stylist for Oh Joy! in Los Angeles, where she lives with her husband, Dave, and their two children Zealand and Bodhi. We chatted with Julia about the elusiveness of work-life balance, and she gave us a few LA insider tips along the way too. Tell us how you came to join the Oh Joy! team from your background in television. I was a reality TV producer for ten years before I came to Oh Joy! My husband and I were engaged at the time. He also works in reality TV, and the production hours are long. I wasn’t satisfied anymore being a producer. I was in the middle of planning our wedding, loved being creative and planning for it, and I had just wrapped on a TV show. My husband suggested that I take that time off to see if there was something else I wanted to do and suggested reaching out to event planners and other creatives to see if I could intern while I was in between jobs and had the free time. Eventually I found Oh Joy! and saw that she was hiring. I applied, and the rest is history. You are a working mother of two, how do you find time to dedicate to your health? Being a working mom is hard. Being a working mom of two is chaos. I have a full time day job but once I leave the studio, I continue with my other full time job as a mom. What has kept me from focusing on myself was the lack of time and how tired I’d be at the end of the day after putting both my kids to bed. After my son was born, I decided to give myself six months of enjoying him and to focus on my new life as a mom of two and then start focusing on my health. It was also conveniently when the New Year started. What has helped is working out at home, which is why I love Studio LB. I can turn on a 30 minute Quick Burn and do it once my kids are in bed in the comfort of my home. I needed to get the train in motion and once I did, I realized the 30 minutes I spend on myself working out has made me happier and has given me more energy, making me a better mom, wife, and person overall. We really appreciated the real talk from your Instagram post in January about accepting your post-partum body. Has Studio LB been part of your fitness routine, and does sharing and connecting on social media motivate you? I’ve found a great support system and mom tribe on social media. Studio LB has been a major part in my fitness journey and I love sharing it with others. It has been so amazing to have so many supportive moms. Talking about it also holds me accountable too. Do you have a favorite meal, snack or drink that only locals would know about around LA? Ohana Poke is my favorite go to lunch. I get it with olive oil kale as the base and it’s my jam. I try and stay away from sweet treats, but they have my all time favorite chocolate chip cookie there too. My fave milk tea drinks are from Milk+T but I haven’t had one since January. I miss it! You can keep up with Julia on all things family, fitness, and French bulldogs on Instagram @juliasirwester. Photography by Casey Brodley, Morgan Pansing and Lily Glass. As the earth rotated around the sun on March 20th, the Spring Equinox marked the transition to a new season and the very welcoming equal balance of daylight and darkness. The seasonal shift invokes hope and a change in habits: fresh perspective, new rituals, a clean slate. Speaking of new rituals, this week we’re incorporating outdoor walking into the weekly schedule. Walking (fast) in the fresh air is great for feeling strong, alive, connected, and forward-moving. I’ve been walking several times per week for the past couple of weeks and it’s been a real game changer in the way I feel, both mentally and physically. Get inspired and make a playlist with your favorite music (or use ours) and keep proper walking form in mind: Stand tall, eyes forward, strike with the heel, roll through the foot, push off the toes, and squeeze the glutes. Ah, balance. The buzz word all over the gram. Those balance posts drive me nuts more than statement tees do. Balance is everywhere and we’re all searching hard for it. And we should be, because it’s super important. Without it, we can feel kinda anxious and lost. Balance (or, happiness, IMO) is really a very personal thing and it’s super interesting because it looks so very different for each of us. It relates to our life, mind-set, and our lifestyle. It's about making healthy choices and feeling good, but also allowing yourself the freedom to have fun and be flexible so you’re not hyper-obsessed about every workout and meal. Balance is the wellness homeostasis that we’re all striving for, right? But do we even know what it means? Figuring out what it means to YOU is step one. Then, how do we sustain a lifestyle that is fun and makes us feel incredible (healthy) rather than guilty or anxiety-ridden? I’m asked this question everyday, and I’m here to tell you that it’s totally 100% possible! Just like it takes time to reach your fitness goals, balance definitely doesn't happen overnight. And, sometimes you have to really forgo it to fully learn how to achieve it. For example, If you’re goal-getting, trying to lose weight, or level-up and become your most fit…there’s not going to be much balance happening. You cannot be downing burgers and beers on a weekly basis and achieve your goals. BUT, if you can’t have a little wine and dark chocolate what’s the point, right? Everyday people ask me about what I do to stay fit (this thing called Studio LB), what I eat, and if I’m restrictive all the time. Honestly, I don’t feel like I’m enforcing restrictions on myself, because I feel like I've found my balance. I do try to maintain a healthy, low sugar diet, but if I’m craving something sweet I’ll indulge in some Nutella (on an apple), or a healthy thin crust pizza. But not every night. I do enjoy a glass of wine every night and that’s my non-negotiable. If I want or need to kick it into high gear and become leaner, I’ll nix the wine and choose something with less sugar. My diet is often 90/10 or 95/5, but, I’m prepared to sacrifice certain things because I truly love the way training and great nutrition make me feel and look. Do I ever reach for the Potato chips? Of course, maybe once a month, but I'm def not pining over them. So how do we do it? With a little bit of mindfulness and awareness. By being mindful and raising our awareness on the things that cause us to feel imbalanced, we can overcome what has thrown us off-balance. When it comes to creating more balance, I recommend making small changes instead of enforcing restrictions. Sounds like LB 100, right? For example, choose vodka + La Croix over that glass of wine. Try cooking in chicken broth instead of butter a few days a week. Cook four nights a week instead of ordering takeout or eating out. Try to move a little more every day: Walk to work instead of taking the train, take the stairs instead of the elevator. Park on the far end of the parking lot so that you walk more during the day. When it comes to exercise, do what you love. Bottom line is, If you don’t enjoy it, you won’t stick with it. If you’re new to this, or are trying to achieve your balance, I always recommend starting with the 80/20 rule. Make healthy choices 80% of the time and allow yourself the freedom to enjoy the things you crave 20% of the time. And when you’re ready to take it to the next level, make the 20% the healthiest indulgent choices you possibly can.